In 2003, the tax code was altered to bring the tax rate on dividend income down to 15%, to match the tax rate on capital gains. That was, in a sense, a revolutionary move, at least for the US, since dividends had been taxed much more heavily than capital gains for much of the previous century. I did write a paper in 2003 about the potential implications of the tax law change for businesses that you can read. In effect, I argued that the tax change would have a positive effect on stock prices, that the effect would be greater for "high" dividend paying stocks than for non-dividend paying stocks and that corporate dividend policy would be altered by the change. Now that there is the possibility that the law will be reversed, it is time to revisit the issue. To understand the impact of investor taxes on dividends, let's begin by looking at how you would price stocks in a world where interest income, dividend income and capital gains are not taxed. Let's assume that the risk free rate is 1.5% and that stocks are collectively paying a dividend yield of 2%. To induce you, as a risk averse investor, to invest in stocks, you would need to be offered a premium (at least on an expected basis) over the risk free rate. Let's assume that you would demand a premium of 4.5%, after personal taxes, to shift from the riskfree asset to risky equities. Thus, you would need to earn a 6% return (1.5%+4.5%), after personal taxes, to invest in stocks. Since this is a world with no taxes, your pre-tax expected return would also by 6%; with a dividend yield of 2%, the expected price appreciation on stocks would have to be 4%. Thus, if stocks continue to pay a 2% dividend, the expected price appreciation would need to 5.06%. The higher required return would mean that stock prices would have to drop, relative to what they were in a world with no taxes. With the existing tax law, we are close to this tax regime (with the only difference being that interest income is taxed at a higher tax rate). This is close to the current tax regime. Solving for X, we get a required pre-tax price appreciation of 6% and a required pre-tax return of 8%. That would translate into a significant drop in stock prices. The expected pre-tax price appreciation would have to be 6.25% and the required return on a pre-tax basis would have to be 8.26% on the S&P 500, yielding an equity risk premium of 6.71% over the riskfree rate of 1.55%. Holding the cash flows the same and changing the equity risk premium to 6.71% yields a value of 1201.22 for the S&P 500, a drop of about 14.60% in the index from current levels. If you don't agree with the assumptions I have made, not a big deal. I have attached the spreadsheet that I used and you can compute your own estimate. Note, though, that the effect of the reversal in the tax law will not be uniform, since every company does not have a dividend yield of 2%. Companies with high dividend yields, that continue to pay those dividends, will see expected returns increase more and stock prices drop by a more significant margin. In the graph below, I have compute the percentage change in stock prices you can expect in stocks with dividend yields of 0% to 4%. 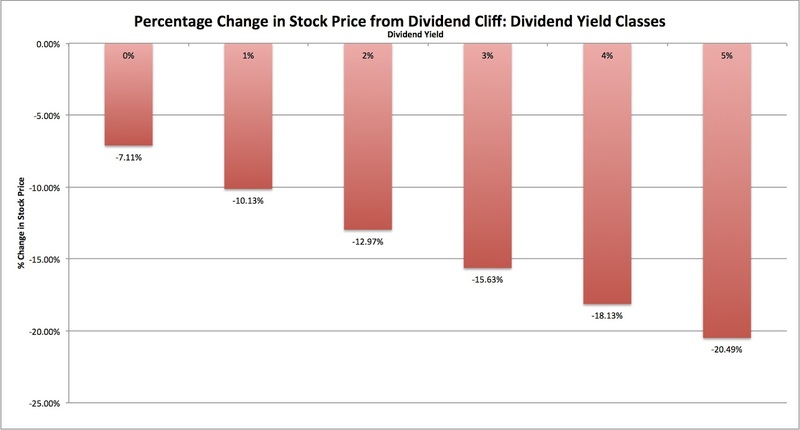 Note that the stocks with the 4% dividend yield, holding all else constant, will see stock prices drop by 18%,, whereas the stocks with the 0% dividend yield will see a price drop of only 7%. Again, you can use the spreadsheet and alter my assumptions, if you so desire, and compute the effect on any individual stock. This analysis suggests that a sharp correction is ahead for stocks collectively and especially so for high dividend paying stocks. It is, however, based on a set of assumptions about tax law and markets that may not be correct. So, what are the weakest links in this analysis? 1. 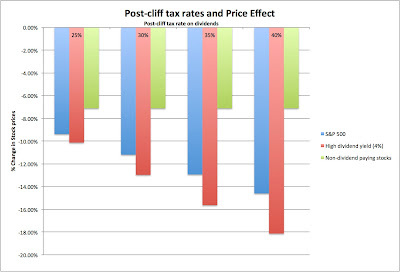 There is no chance that the fiscal cliff will become reality: This is not the first time that we have faced the possibility of the tax laws reverting back to pre-2003 levels. At the end of 2011, faced with the possibility, Congress and the administration pushed off the day of reckoning at the last moment. It is possible that faced with the catastrophic consequences of going over the cliff, Congress will find a way to avoid it again, but is it guaranteed? Having seen the political dysfunction at both ends of Pennsylvania Avenue over the last decade, I am not as confident as others may be that common sense will prevail and that the cliff will be avoided. 2. Not all investors pay taxes on investment income: In my analysis, I used the tax rates on wealthy individual investors to make my assessment, but tax rates vary widely across investors. There are two critiques that can be mounted. The first is that about 60-70% of stocks are held by non-individuals: mutual funds, pension funds and corporations and the tax rates that these investors may not be affected (or at least not as much) by the change in the tax law. The second is that companies that pay high dividends attract investors who like those high dividends and it is possible that these investors make less income and face less of a hit from the change in the tax law. Note, though, that even if we factor in these investors, the basic analysis still holds but the impact will be lightened. In fact, one way to alter the analysis is to take a weighted average tax rate across all investors in the market, which would buffer the impact. The graph below estimates the effect on the market, stocks with a dividend yield of 4% and stocks with a dividend yield of 0% of assuming lower tax rates in the post-cliff period. 3. 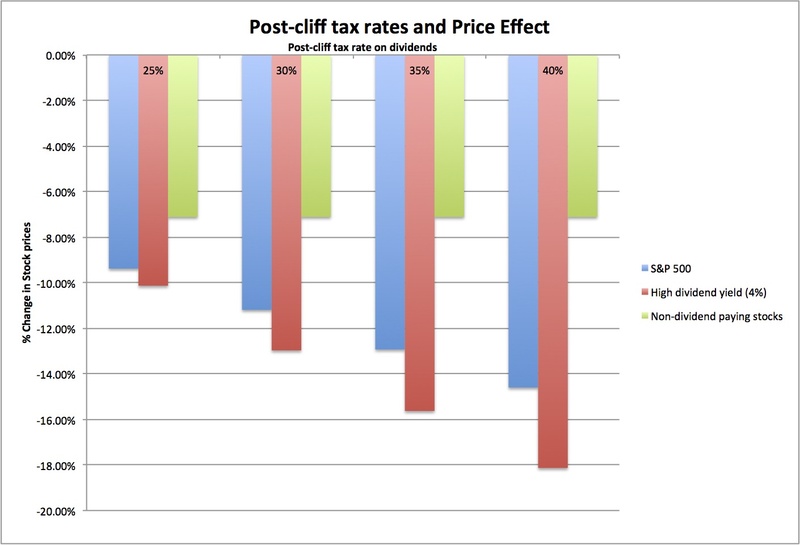 Investors may already have built in the expectation that tax laws will change into current stock prices: To the extent that the fiscal cliff has been in the news and widely reported, it is possible that the market has already incorporated the possibility of it coming to fruition into stock prices and the expected return. I would have been inclined to believe this if I had seen the equity risk premium climb, and stock prices drop, over the course of the year, but they have not. In fact, we started the year with a much higher equity risk premium of 6.04% and have seen the premium drift down to 5.75%. 4. Companies may change their dividend policy: I did predicate my analysis on companies maintaining their dividends at 2012 levels, even if the tax law changes to tax dividends more highly in 2013. In fact, if companies were completely flexible, they could stop paying dividends and largely nullify the impact of the tax law change. History suggests that this is unlikely. If there is a word that best describes dividends, it is that they are "sticky", i.e.. that companies are reluctant to change dividends and especially to cut them. In fact, the 2003 law did not to lead to a surge in dividends (though a few companies pay special dividends in the immediate aftermath) and I don't think that a reversal of the law will lead to a sudden reassessment of dividend policy. Bottom line: I may be overly pessimistic, but the dividend cliff scares me and I am planning for the eventuality that the tax code will change drastically on January 1, 2013. I am and will continue pruning my portfolio, shifting my money from large dividend-paying US stocks to non-dividend paying or low-dividend paying foreign stocks. I won't go overboard and sell short/ buy puts on high dividend paying stocks. After all, the dividend tax effect is one of many forces that will affect equity markets over the next few months and it is possible that one of these effects will drown out the tax effect.